A central issue with corrosion is how does the initial oxide form, and how do ordered monolayer chemisorbed oxygen or hydroxide layers evolve into three-dimensional nanoscale structures, and from this to more macroscopic corrosion products. Imaging these after the fact can be useful, but often will not show all the details. Much better is to image in detail during oxidation. Dating back to the work in Cambridge the late 70's, in-situ transmission electron microscopy oxidation experiments have played a key role in understanding the fundamentals. There are now many instruments where imaging can be combined with oxidation at elevated temperatures, to which we have easy access, but they all suffer from one critical limitation - the initial state of the sample cannot be controlled. Particularly for systems containing reactive elements this is a fundamental limitation. At Northwestern University we have a unique UHV transmission electron microscope and side chamber system called SPEAR (right). The UHV microscope is a custom modification of the Hitachi H-9000 TEM. In a joint development with Hitachi it was redesigned to be fully UHV compatible and fully bakeable to 200C. Initially targeted to reach 5x10-10 torr, after changing two gate valves it reached a stable 2x10-10 torr during operation. During installation of SPEAR (part of the secondary pumping (of the microscope) was redesigned resulting in a stable operational pressure of 5x10-11 torr. In terms of mechanical stability the instrument has a resolution of better than 0.18nm at 300kV. 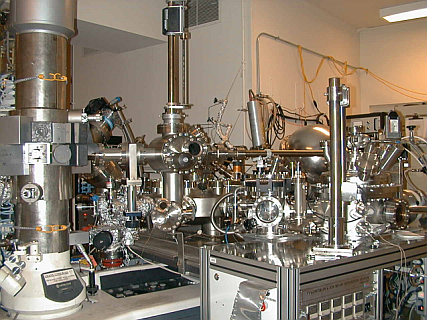 In addition to standard electron microscopy, the instrument is equipped with a Gatan Parallel Electron Energy Loss Spectrometer which is used for examining chemical purity, quantitative measurement of diffraction spot intensities and determining sample thicknesses. It is also equipped with a Teitz slow-scan camera which allows for real time observation of images.